Solatube -- meets energy standards. CHANGES to building codes which came into force this year favour skylights that not only reduce energy needs by making best use of natural light, but also those that prevent heat transfer into and out of buildings. State governments have adopted the new building codes which require all skylights meet stringent energy efficiency standards. The Australian Building Code Board (ABCB) is responsible for drafting the legislation, and expects to impose further changes within two years in a bid to continue the energy efficiency of skylighting products. "Of particular concern are the conventional square skylights with large surface areas open to the sky, some of which can allow too much heat to enter on hot days, and escape on cold days," Solatube general manager John Clark said. Tubular skylights require a far smaller opening in the 'skin' of a roof, and are far more energy efficient. Solatube, which designed the original tubular skylight in Australia almost 15 years ago, has led the way in energy efficiency research, continually improving is range and brightening the lives of hundreds of thousands of people throughout the world. Its patented system dissipates heat into the roof cavity before it can raise the temperature of the room being lit. 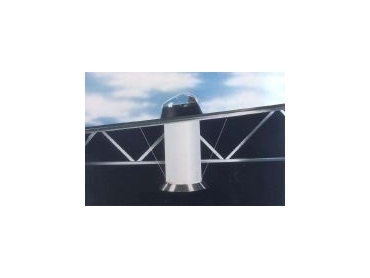 Roof-mounted reflectors, which are contained in a tough and unobtrusive acrylic dome, are individually angled to catch the maximum sunlight available. * New Infinity tubing with 99%+ reflectivity that produces 400% more light than similar products. * LTDs (Light Transfer Device) to collect light and transfer it down a highly reflective mirror light shaft into an efficient clear, opal or opaque diffuser in the ceiling of the room below. * Skylights sealed at both the top and bottom, ensuring heat is not transferred into or out of the room. This makes the skylight more like a 'double glazed' window. * UV treated, high impact hail resistant acrylic dome to withstand the elements. * Delivery of as much natural light as far larger conventional skylights, but without the heat transfer. * Precision-built parts, tooled exclusively for Solatube to international and export standards. * Ability to incorporate electric light and/or ventilation, thereby reducing the number of fixtures on the ceiling. * Flexible design, which integrates into a broad range of roof types, such as tile and iron, using the exclusive range of Solatube roof fittings.